A vehicle repair and parts sales business in Allston is celebrating its 100th anniversary. George Arcand, grandfather of the current owner, started the business in 1908. 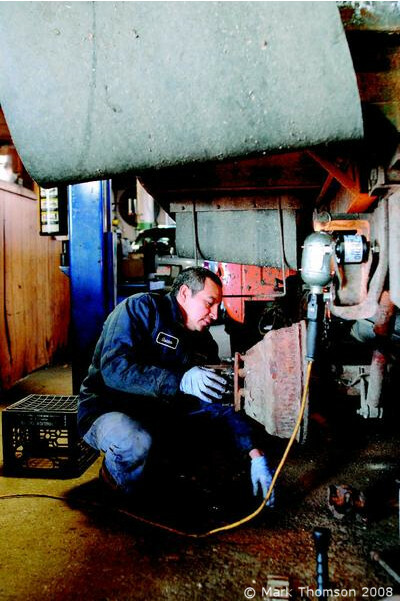 Oscar Calderon works on the brakes of a municipal vehicle at Suspension Specialists in Allston. One-hundred years ago, Arcand Spring Company opened around where the Prudential Tower now stands. It mainly served as a blacksmith shop specializing in springs and suspensions on carriages and coaches, and had just a few employees. Now, the business is located on Brighton Avenue and has 11 employees. Juan Ochoa, who has worked at Suspension Specialists for nine years, works on a truck in the Allston Garage. It operates in conjunction with Suspension Specialists Inc. which the owners of the original business added in 1992. The businesses dovetail each other and conduct a wider variety of repairs on municipal, commercial and personal motor vehicles. As the family-owned business celebrates its 100th anniversary this year, owner Dan Arcand is reflecting on the business’s rich history. He is also thinking about the future, hoping the business’s niche in spring-making can keep it alive for at least another 100 years. Springs are used in vehicle suspension systems to absorb or lessen energy. “I would hope we could carry it on to one of my nephews or someone else in the family,” Arcand, 58, of Wellesley, said of his business. The company was started in 1908 by Arcand’s grandfather, George Arcand. George Arcand, a Montreal native, learned vehicle mechanics and blacksmithing from working for one of the Fisher brothers in Amesbury. The Fishers eventually became famous for their vehicle frames, which General Motors built its vehicles. Dan Arcand did not know which brother his grandfather worked for. 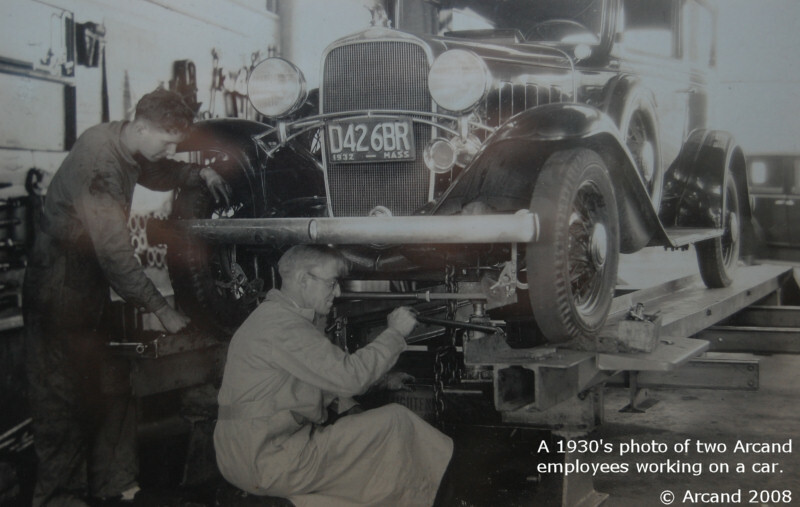 George Arcand started the original company at a time when dozens of other Boston area companies were making springs for suspension systems. There was a demand for their services, and they would bid against one another on all jobs. “That’s kind of unheard of now,” Dan Arcand said. When George Arcand died in 1918 from the worldwide flu pandemic, his wife, Rosabla, took over the business with her son, Ed, the youngest of seven children. In 1920, the mother-and-son duo decided to move to the business to its current location in Allston, at 229 Brighton Ave. They opened four more locations in the 1920s and 1930s, in Charlestown, South Boston, Providence, R.I., and at 50 North Beacon St. in Allston. At one point, the business had about 40 employees, Dan Arcand said, including Rosabla Arcand’s seven children. A greater percentage of employees handled inventory and finances back then, Dan Arcand said. 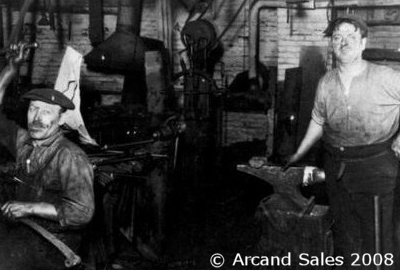 A 1918 photo of two blacksmiths in the Arcand Spring Company shop. The one on the right is company founder George Arcand. 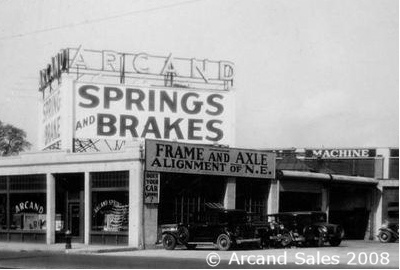 A 1930s photo of Arcand Spring Company. When World War II started, and men left for the military, the Charlestown, South Boston and 50 North Beach St. branches closed due to a labor shortage. In the 1950s, the family sold the Providence branch. The 229 Brighton Ave. location is now managed by Dan Arcand and Bill Head. They work out of a building that is double its original size as a result of an expansion in 1975. The building’s surroundings have also diversified over time. It used to belong to a sort of “auto row,” with many car dealerships from Union Square to Kenmore Square. “It was as busy as Route 1 [in Boston] is now,” he said, noting car dealerships started leaving in the 1960 and 1970s. The company now conducts a wide variety of suspension-related repairs, including brake repair, alignment and balancing of axles. It services all types and sizes of motor vehicles, with about 50 percent of its business coming from local municipalities. Big municipal trucks, such as fire trucks, tend to need specialized springs and spring parts, which the company still makes with furnaces from the 1920s and 1930s. The furnaces are no longer manufactured and work better than any modern equipment, Arcand said. As a result, few companies still make their own springs and spring components in greater Boston. That niche should help the company stay alive for many years, he said. The company, which also stocks a large variety of suspension and brake parts for vehicles, is also benefiting from a tough economy. People seem more interested in fixing the vehicles they have than buying new ones, he said. Copyright 2008 GateHouse Media, Inc.